ISLAMABAD - Former Pakistan captain Javed Miandad had only good things to say about current Indian captain, Virat Kohli , who has been on a record-breaking spree lately. 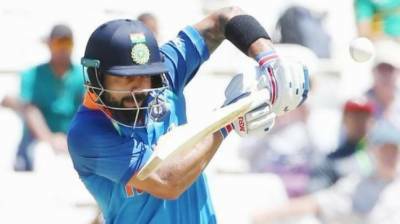 Kohli on Wednesday hammered his 34th ODI ton and 55th in international cricket during the third ODI against South Africa at Cape Town. Kohli's unbeaten 159-ball 160 helped India post 303/6 from their 50 overs. In reply, the Proteas fell apart and lost the match by 124 runs and are now 0-3 behind in the six-match series. Speaking about Kohli's current form and his capabilities, Miandad said that his Kohli is a genius and the best in the world. "To me, the mark of a great batsman, like Kohli is the fact that he can vary his technique by quickly understanding the strengths and weaknesses of the bowlers. Kohli is a genius who is the best batsman in the world," Miandad said. He went on to add that Kohli's technique gave him the edge over other batsmen around the world. "What I really admire about Indian batsmen and the reason why they are so successful, is the fact that their batting technique is correct. In Virat Kohli's case his batting method is what allows him to score runs not just once but almost every time he comes in to bat. If a batsman's technique is bad, he can put some runs on the board once in a while, but he will not be able to do that consistently which is exactly true in Kohli's case," Miandad added. Not only Miandad, another Pakistan legend was in awe of the Indian captain. Bowling legend Wasim Akram said Kohli was a treat to watch and felt even he would struggle against the swashbuckling Delhi batsman. "Kohli is a treat to watch. At times when you do think or imagine if I was young and playing against Virat Kohli where would I bowl and I do feel it would be a bit difficult to bowl at him. It doesn't matter what sort of pitch it is because he is a complete player. I think in world cricket after Sachin Tendulkar, it's his turn now," Akram told India Today. He also praised Kohli the captain and said that he leads from the front: "It depends on a leader, he is leading from the front, he is a supreme athlete, he is getting runs every game. First innings, second innings, Test match, ODIs, T20Is...I think Kohli is not only a role model for India, he is a role model all over the world." Kohli has already scored three hundreds in South Africa during this tour and will look to add more to his tally in the next three ODIs and following T20Is.